We usually adore this cool evocation of Sicily in Soho and the bustle suggests other Londoners have taken Gelupo to heart too. Yet we were disappointed in the flavours on our most recent visit. Kiwi with gin and elderflower tasted of little except elderflower; coconut gelato had a cloying soapy quality, while watermelon with cinnamon and jasmine smacked of floral toiletries. We should have stuck with Gelupo classics, such as black forest cherry and chocolate, blood-orange granita or one of the ewe’s milk ricotta ices – you can at least be guaranteed of a great range of flavours. Service is zippy. Italian biscuits and cakes, coffee, gourmet sandwiches and an appealing selection of groceries make Gelupo a handy spot to know year round. Late closing puts it high on the list of things to do after an outing to the theatre, cinema or pub. This is my favourite gelato in London. I'm obsessed with gelato, when I'm in Italy I have it once a day (sometimes even more, lol) and Gelupo was such an amazing find in Central London. A little shop with pretty interiors reminding of Southern Italian decorations, selling high quality organic products (I could find jams and preserves from my tiny hometown in Tuscany) and truly amazing gelato, with interesting flavours changing every week. My favourite one so far has been the pumpkin cinnamon gelato with amaretto... pure autumnal heaven! And make sure you try the ricotta and sour cherry one. A hidden gem just off shaftsbury avenue. We were expecting a queue but we didn't have to wait too long. Service did seem a little disorganised but the ice cream did not disappoint. I had the bitter chocolate and raspberry both of which were divine. I'll be back to try out some more flavors soon! Yet another excellent gelateria in London! I’ve heard many people talk about and recommend Gelupo but never had a chance to try it before I found out I was lactose intolerant about a year ago. However, that last part has not stopped me from consuming dairy products – in particular cheese, gelato, and yogurt! As a foodie, how could it?? In fact, my stomach is still able to process cheese and yogurt in small amounts so it’s not so bad. As for gelato, it’s a little more sensitive but I’ll have it regardless! My friend and I came here for dessert after our celebratory lunch a few weeks ago. As it was a rather hot and sunny day, this was even more fitting of a choice! I tried a few flavours first before going for the Pistachio and Nocciola (Hazelnut). I had this on a cone, as I prefer having my gelato this way – it makes it a real treat with the waffle cone. Both flavours were great! The gelato itself was thick and creamy, it didn’t melt quickly so I didn’t feel inclined to rush to eat it. I thought the Nocciola flavour was stronger than the Pistachio, which I appreciated. I’ve grown to quite enjoy nut flavoured gelato because they aren’t overly sweet, meaning I can consume more! Both of these flavours together was something different – they didn’t clash but they didn’t blend together smoothly either. I liked that I could still taste their individual flavours and that small bit where the two touch gives an interesting blend. As I had two flavours, this was considered a ‘medium’ cone. I would have preferred the ‘small’ cone but being allowed to have 2 flavours because the amount in a ‘medium’ cone was a little too much for my stomach. This branch in Soho has a couple of seats in the back for customers to sit down and enjoy their gelato, which is what my friend and I did. We didn’t want to walk around in the heat and have to worry about our gelato melting as we wondered. We were lucky to have found a small table at the back, as it instantly got more crowded after we ordered! The service was average but the lady serving me looked slightly annoyed/bored that I wanted to try flavours before making a decision (even though I only tried 2 flavours!). Queues all the way around the shop and out the door... and for good reason! 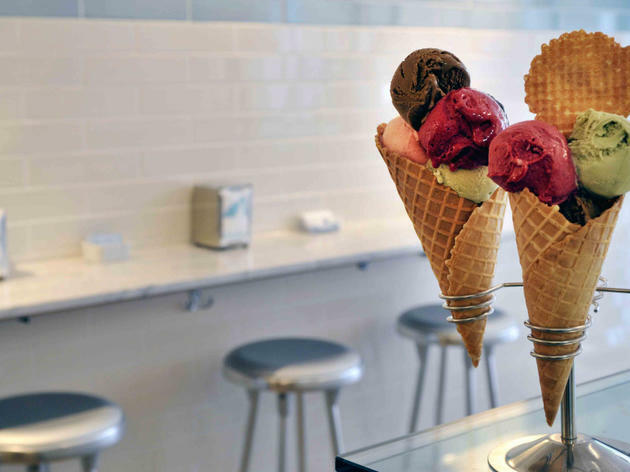 This place has the most delicious gelato in London. It's also a real treat for those with lactose intolerance, as the sorbetti could be mistaken for ice cream with its creamy (but dairy free) texture. Even as someone who can have dairy, I'll always order the chocolate sorbetti because it's so delicious. As close as you can get to a trip to Italy without leaving Soho. The heatwave had us heading straight to Gelupo! At 9 on a Tuesday evening there was a small queue but we didn't have to wait long. The flavours at Gelupo are always tempting - my favourite is Blood Orange which is like eating an icy fresh orange and the Lavender with White Chocolate. Less successful this time round was Bonet (chocolate, caramel, egg yolk, rum and amaretto) which just tasted sugary. That aside, Gelupo's great - friendly service and a quick stop for something cold and sweet in Soho. Hands down my favourite gelato place in London, bang in the heart of Soho. Pistachio fans, this is not to be missed; their seasonal flavours are also definitely worth the calories. My favourites are the Mint Chocolate Chip and the Ricotta & Sour Cherry - a perfect combo of something refreshing, creamy and satisfying, all in one small pot / cone! I have so much praise for Gelupo! Real gelato, excellent and delicious flavours and a really honest place! Best gelato in the city for sure. Gelupo is one of my favourite place for dessert after a meal. I love that Gelupo's gelato are hidden in the container and you have to find them on the wall for flavours of the day. I feel that is the correct way to stored gelato or ice-cream and make them taste fresher. The staff is always friendly and helpful even when the queue is long. Get the festive feeling and try their Xmas pudding and eggnog flavour when you see them on the board! Definitely the best ice cream store in London! Okay maybe second after Odonno's, although it is a close fight. This little gem of a place attracts long queues, even in the most freezing cold of days. They have amazing flavours which are highly imaginative. In fact, they currently have the michelin-star collaboration flavours which are to die for. You get anything from the weird and wacky (Dr Henderson, which is a Dr-pepper inspired flavour from Fergus Henderson) to the refined and exquisite (toasted almonds with cherries from Bruce Poole). I felt like a kid in an ice cream store... maybe because that was exactly what the situation was. Be warned about seating though. There are limited seats so it is first come first serve! But turnover is quick so that should not be a problem at all. The best gelato in London! I don't need an excuse to eat ice cream, but when the days are hot in London, eating (or slurping) it is a necessity for survival. I dragged my friend to Gelupo on Friday to enjoy a scoop or two of delicious ice cream and was in awe of the amazing flavours on offer. I chose a couple of scoops of fruity sorbet: one of watermelon and another of blood orange. I have a watermelon obsession and in this heat it's the perfect refresher, and this sorbet was incredible. The watermelon flavour was strong which is tricky considering it's a fruit predominantly made from water! It wasn't too sweet, and the blood orange was a great contrast as it was sharp and tangy. The colours were gorgeous too, and it didn't take long for me to be slurping the last drips from the bottle of the tub. Not a bad cooling down snack for £4. This is my go to gelato in Soho - no muss, no fuss great-ingredient gelato in a few flavours to choose each day. No, it's not a mile long list, but it will most certainly have something for each palate. From the famous blood orange, to options with creamy yogurt or ricota (always my favourites! ), you can taste a few options to make up your mind, or do like the italians do: get two flavours! Late night sugar treat win! Such a great selection of flavours and the sizes (and prices) are perfect. Would recommend for spring, summer, autumn and winter! A hot sunny day means ICE CREAM sooo we headed straight for Gelupo, which has been on my list to try since England's last spell of warm weather (a decade ago?). It is located on a quiet street in Soho and late afternoon had only a small queue with even 2 seats free out the front! We were instantly served, although I was no where near ready (any choice takes me foreveeeer!) but they kindly let me try a few flavours. It ended up as a toss up between ricotta, coffee and honey or plum crumble. My bf went for a double scoop - coconut and honeycomb - which came in a lovely waffle cone but at £4 was a bit pricey. The scoops themselves were a little small for the price. The honeycomb was bland however the coconut was sooo delish! In the end I chose one scoop of the coffee ice cream which was tasty but sadly came in a sugar cone and cost £3. The ice cream at this place is good, with plenty of appetising flavours, some of which change daily. They also have quite an extensive and refreshing sorbet menu. My biggest issue is cost vs flavour which is just not quite on point, especially considering the outstanding competition in the area (Amorino). Who doesn't love gelato? This place is perfect for a late night after dinner sugar hit, in winter or summer. The range of gelato on offer is brilliant, with the usual classic varieties of chocolate/ nut and fruit. There are tables to perch at and trade flavours with your friends. Only downside is there is no loo, but as this is a quick pit stop or take away that doesn't matter too much. Am a returning customer. Ice creams are great and hot chocolate is incredible! Thick and decadent if you need warming up it's a delicious must. Friendly staff and a good place to go with friends after a dinner out. I lived 7 years in Italy and I know what a great gelato tastes like. Gelupo have half a dozen delicious flavours on offer. The coffee quality is seriously good too. Still my favourite place for ice cream in London since randomly walking in and trying the mint stracatellia flavour. The queue can be take a while to get through especially when everyone wants to sample the new flavours. This is hands down the best ice cream place in London, and i've been to most of them. 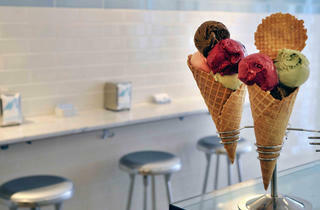 The gelato is smooth, creamy and along with the classic flavours they throw in some interesting ones like gin and kiwi. The shop inside is super cute and a great after dinner spot. I stays open till 11 most nights so perfect for some late night ice cream. Inside you can also find some delectable Italian treats like biscotti, ice-cream cake, olives as big as my eye balls and and array of pasta. If you're ever in soho and craving something sweet I would definitely recommend a trip here. Definitely the best gelato I have had in London. Always a great mix of flavours and something new to try. The staff are always happy to offer suggestions or let you have a taste before you purchase if you are unsure of something. Not the cheapest but definitely worth it! Jasper thinks this ice cream is worth screamING FOR.!!!!!! By far the best gelato in London. Great choice of flavours (pistachio and hazelnut are the favorites so far). Very helpful and cheerful staff. Definately the place to go. I heard amazing things about Gelupo and to a certain extent I was not disappointed. I had the famous blood orange granita, persimmon sorbet and ricotta and sour cherry. I wanted my cone to last forever. Blood orange granita amazing really tastes like nothing else I've ever tried although the texture is not great the flavour is overwhelming after while. Even better in an entirely different way was the Persimmon sorbet. I don't know how they managed to make a sorbet that creamy and it was very delicate (maybe a little bit too delicate). Ricotta with sour cherry was also an interesting revisitation of an Italian classic. The staff was not really helpful but it's understandable considering the fact that it was a Friday night in Soho. I was very much appealed by the Panettone stuffed with ice cream. I am Italian and I had never seen anything of the kind. Every so often I have an evening that reminds me why I live in London. The sort of evening which lingers in my memory like a half-forgotten sitcom episode – everyone is young and glowing; we laugh endlessly; we casually drift from fashionable Soho establishment to fashionable Soho establishment. Nobody makes us queue, we get a seat in the pub, and it doesn’t rain. It was at the end of one of these very evenings that I first visited Gelupo. It was around eleven, post-show, post-dinner. The queue was long but we needed the time to argue over flavours and admire the huge cakes we were too full to attempt. They were running low on gelato and the last mound of bitter chocolate was cruelly snatched by the lady ahead of me. I went for two scoops in a waffle cone, which didn’t seem extravagant until I saw the improbable heights to which my scoops were sculpted. Ricotta and sour cherry was perfect: creamy and mild but laced with sharpness. Less thrilling was burnt sugar; it was lovely for a lick but with a bitter aftertaste that became overpowering after a while. I missed the lack of bitter chocolate, which felt like the perfect partner for the cherry. A friend’s pistachio was spot-on, while the sambuca cherry was refreshing (but I could have lived without the boozy kick). Espressos were downed with gusto; they smelt glorious and the terrible night’s sleep that ensued was testament to the coffee’s power. A lovely, brief reminder of the fun of living in a city that doesn’t sleep… well, until about midnight. Try one scoop of Gelupo's dark chocolate sorbet and one scoop of blood orange.. they're delicious together! At the time of my last visit, my diet was 'dairy free' and i was desperately craving a chocolate desert. The dark chocolate sorbet tasted surprisingly rich and creamy, i was delighted. I've recommended Gelupo's to every one of my friends and family. amazing..! best ice cream ever! Exceptional gelato, like no where else in London. Great flavours that seem to change every time I walk past. It's not easy for me to write this as I've been a huge fan of Gelupo ever since it opened, but feel like the quality and selection have gone down a bit in recent months. The gelato menu is not as interesting as it once was and the ice cream is tending towards being just slightly too sweet and at the expense of flavour. Had the strawberry sorbet the last time I visited and dare I say it, it was not great. Not sure if anyone agrees so am posting this to see if anyone whose been there since the early days agree. Still good gelato but no longer great and these days I prefer La Gelateria down by Trafalgar. Gelupo serves the best gelato I've had in London - and better gelato than many places in Italy, too! Wow. Tasting is possible, and the staff were friendly and lively. Oh my god. The best gelato in town. Hands down. I was served by the chef (i think) which was a nice touch and had raspberry, chocolate and coconut. The coconut was amazing. I've been all over Italy, I've been to NY, and to Freggo, Scoop, Gelatorino, Amorino, and all the rest. This is the best. Creamy, vibrant flavours. V. nice people too. We snuck into this little ice-cream place during the interval of Thriller - amazing. Super-smooth pistachio and the best chocolate sorbet EVER! The girl behind the counter was really sweet, forcing little tastes of everything on us, then making hubby the "most interesting" espresso he's had in London. Packed, with a haphazard queueing system, but awesome! The ice cream is good, but quite on the low-fat side, and I can taste the (all natural, according to the website) additives meant to keep it together without the fatty stuff. So, less guilt, but also less satisfaction. Since gelato is a rare treat for me anyway, I rather go for the cream-rich, calorie-laden decadent variety, as made by GelatoMio, Oddono or Freggo.